While Mazda Motorsports is in Detroit for this weekend’s Grand Prix on Belle Isle, they used the M1 Concourse racetrack to show off the connection between its racing and commercial models. Mazda had its racing team and a fleet of vehicles available at the racetrack in Pontiac Wednesday, May 31. 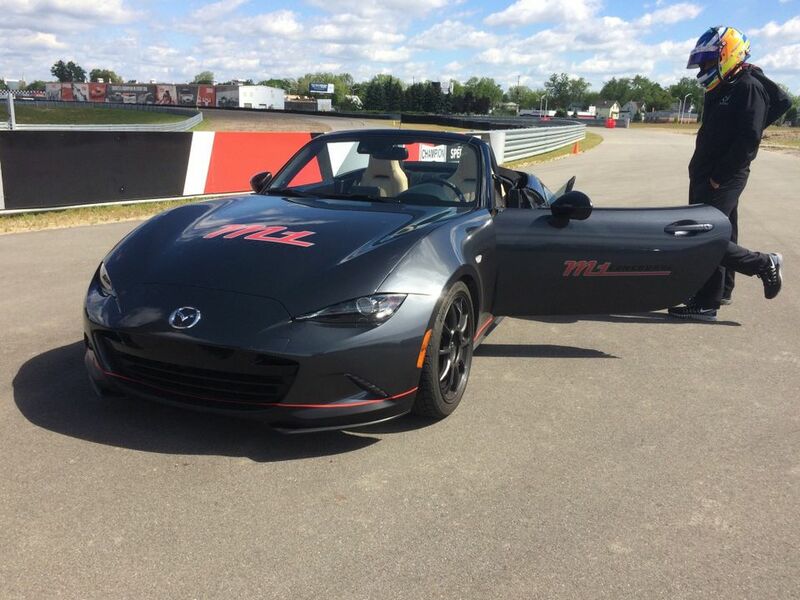 Before taking one out there himself, driver Tom Long whipped MLive reporter Benjamin Raven around in the Mazda Global MX-5 Cup car around the winding track in Metro Detroit. The 2017 Chevrolet Detroit Belle Isle Grand Prix is set for Friday, June 2, Saturday and Sunday. The action gets started early Friday with gates opening at 7:30 a.m.
Verizon IndyCar practice is set for 10:20 a.m., SPEED SUPER Truck Series qualifying at 11:25 a.m., and the first race of the weekend in the Trans Am Series is set for 2:45 p.m.
Long splits driving duties with Joel Miller in the 100-minute race set for Saturday on the island. To check out the weekend’s full schedule, click here. For event or ticket information, visit the Grand Prix’s website or call 866-464-7749. The M1 Concourse opened in 2016 and has a 1.5-mile track on 87 acres of land with condos, private garages and — soon to be — a public retail space. The Mazda MX-5 Cup race car starts at $58,900, and the automaker says it has sold around 140 of the models. These cup cars are built as MX-5 road cars from the company’s factory in Hiroshima, Japan before they are shipped stateside.